Once again, it is time for our weekly news round-up, where we put the most interesting stories from the past seven days for anyone who needs to catch up. Let's start by rewinding to last week's highlight event – the announcement of the HTC One A9. While the phone is not exactly a high-end model, it is to replace the M9 in the U.S. as HTC's flagship. 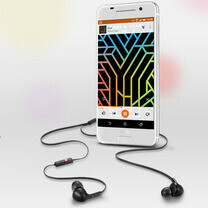 Costing $400 unlocked, albeit for a limited time, the One A9 blends premium design with an adequate specs sheet and a decent set of features, including a 13MP camera with OIS, Android 6.0 at launch, and support for high-res audio. In other news, the Samsung Galaxy S7 might come with a 20MP camera, according to speculations. The rumor was sparked after the announcement of a new ISOCELL camera sensor, measuring 1/2.6" and sporting 1.0 micron-sized pixels. Last week also brought us a handful of leaks revolving around Motorola's yet-unannounced smartphones for Verizon. These are the Motorola DROID Turbo 2, which is expected to feature "shatter-proof" glass protecting its display, and the Motorola DROID MAXX 2, which is shaping up as a rebranded Moto X Play. Both phones should be made official on Tuesday, October 27. For more on last week's most interesting news, flip through the slideshow below. The HTC One A9 is a beautiful, all-metal piece of tech. On its front, it has a 5-inch display, accompanied by a fingerprint sensor at the bottom. Under its hood, there is a 64-bit midrange-class Qualcomm Snapdragon 617 humming with 4 of its cores clocked at 1.5 GHz, and the other 4 – at 1.2 GHz. The phone will be available in two variants – one with 32 GB of internal storage and 3 GB of RAM, while the second will have 16 GB of storage and just 2 GB of RAM. Both variants will accept microSD cards for expansion purposes. Samsung just boasted about a new 20MP camera sensor it has developed, and the Galaxy S7 seems like the best and most logical choice to showcase it, seeing that all the company's current flagship smartphones are now out. The 20MP sensor measures 1/2.6" and has 1.0 micron-sized pixels, while boasting reduced power draw, thanks to being made on a 28nm process (coming all the way down from 65nm as seen in Samsung's 16MP 1.2 micron sensor used in its recent Galaxy phones). It's been known for a while that Samsung has plans for a gargantuan tablet featuring an 18.4-inch display. And here it is – the Galaxy View, exposed in a set of leaked photos. According to leaks and rumors, the Droid MAXX 2 will offer a 5.5-inch screen with a 1080 x 1920 resolution. A Snapdragon 617 SoC will be under the hood, equipped with an octa-core 1.8GHz CPU. 16GB of internal storage will be inside, along with a 128GB capacity microSD slot. As for the Motorola Droid Turbo 2, a 25W charger will be in the box. The 21MP rear camera will feature zero shutter lag and will have Rapid focus. There will be 32GB and 64GB variations of the device. The 64GB model will be available only from the Moto Maker site and will include the ability to refresh the design within two-years. If you're familiar with Music Key, you know the basics of the newly announced YouTube Red – for $9.99 you'll get an ad-free experience on YouTube as well as options for background and offline playback. There are a few big differences though. First, YouTube Red covers all of YouTube, not just music content. Second, YouTube Red will still be bundled with Play Music All Access. Apple pushed out iOS 9.1 last week, coming a bit more than a month after the release of iOS 9. The latest build of Apple's mobile OS includes a number of new emoji, such as a taco, burrito, cheese wedge, a turkey, and more. In addition, the Live Photos feature now can sense when you raise or lower your iPhone, so as to prevent the camera from shooting video of this movement. And lastly, there's a new budget-friendly Android smartphone coming from the far east. It is called the Meizu Blue Charm and packs good value for its money. It features a 5.5-inch LTPS LCD with 1080 x 1920-pixel resolution, a MediaTek Helio X10, 2GB of RAM, and a 13MP camera. The phone will cost the equivalent of $200 or below, but only in China, where it is to launch soon. If the phone becomes available outside of China, it is likely to cost a tad more. nice news corverages, but full of data-sucking ads!